If you love your coffee, you'll know that it can make you feel jittery, increase feelings of anxiety, affect your sleeping pattern, it could even give you headaches. Hydrate your body by drinking a mug of warm water with a lemon slice in it before your first cuppa. This simple but effective detoxifying drink will hydrate your system and flush toxins out of your GI tract that your body has been working to get rid of while you’ve been asleep. It will also wake your digestive system. 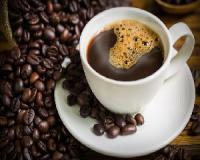 Many coffee shops use processed, instant coffee, which is acidic to the body and bad for your health. Choose organic coffee instead, which you’ll find at most local coffee vendors. Sure – extras like whipped cream and sugar can be delicious in a cup of coffee, but at the end of the day they only make your cuppa unhealthy. Enjoy your coffee plain Americano style, or add a spoon of coconut oil as creamer and cinnamon for a yummy spicy taste! These are both healthy additions to a superb cup of coffee. Until now, there was nothing you could do but accept your fatigue and watch from the sidelines as the world went by. Coffee is 99% water and if you're going to use the healthiest ingredients, besides the organic coffee, all you need is filtered water.